2 – Select Option to edit (e). 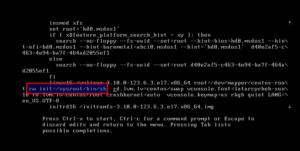 3 – Go to the line of Linux 16 and change ro with rw init=/sysroot/bin/sh. 4 – Now press Control+x to start on single user mode. reset root password5 – Now access the system with this command. 6 – Reset the password.